Sometimes you may receive a warning that your work is overdue and should have been finished by the current day or several days ago. Targetprocess can be configured to point out expired items. Filter out only items that match some criteria. For example, let the view show you expired items only. 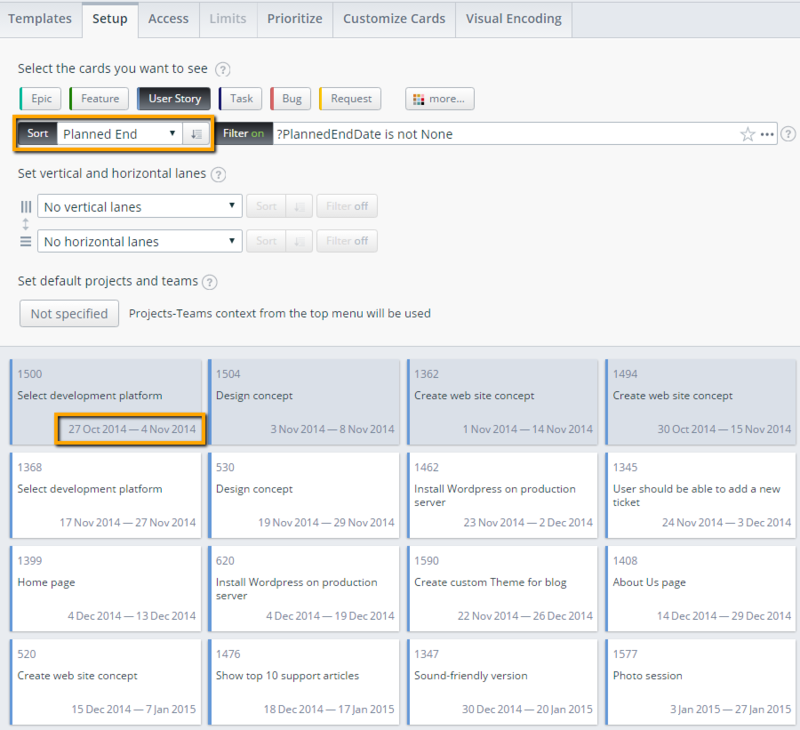 Every work item and most other entity types in Targetprocess can have a planned start and end date. 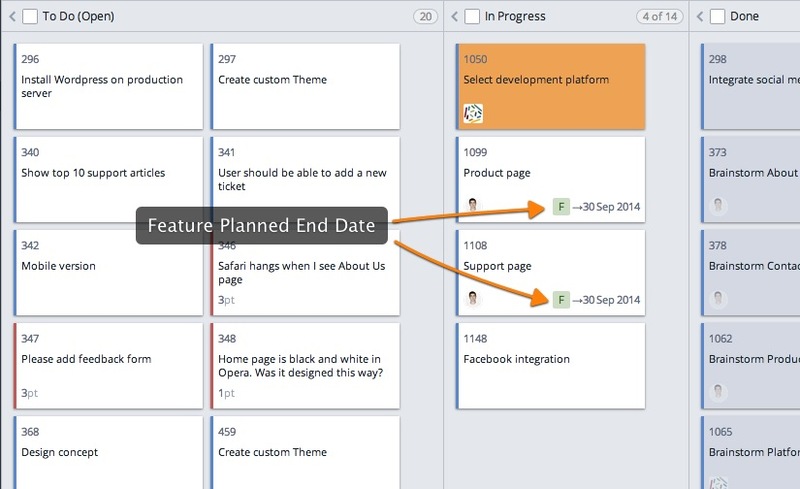 It is possible to manage planned dates with Timeline Views as well. Timeline mode is recommended to see actual vs planned progress. If you take a look at the Timeline view, you'll see planned dates being shown with a dotted line, and the space between actual dates will have either white (open work) or grey (completed work) background. 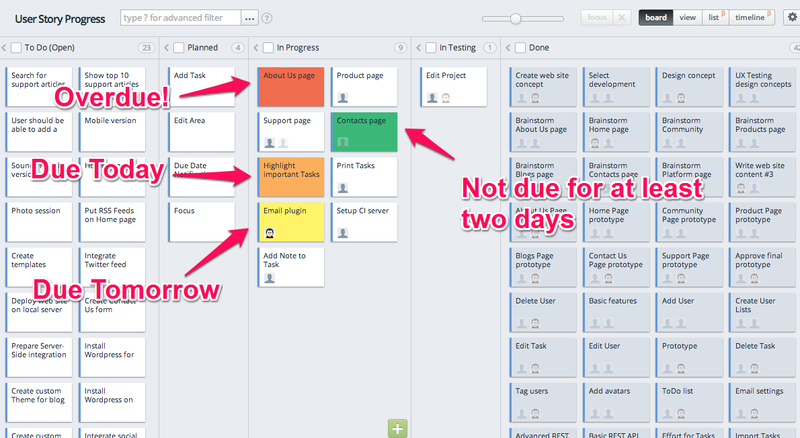 In Timeline views you can adjust planned end dates with drag-n-drop mouse action. You can move cards from Backlog to the Timeline by drag-n-drop. 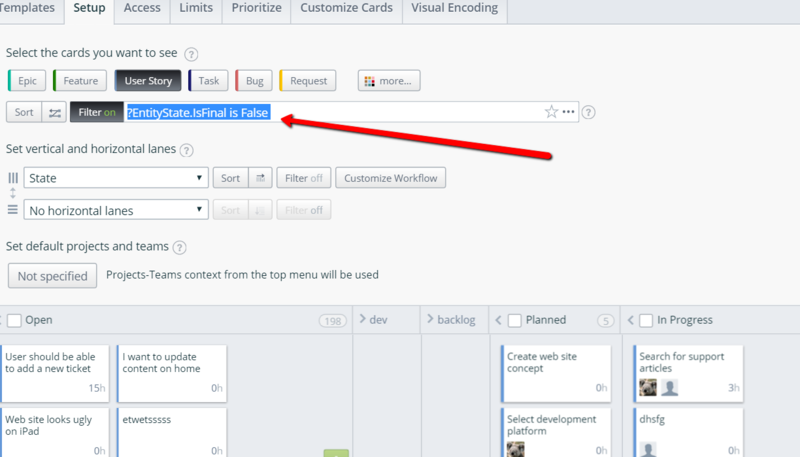 When a card is moved to a Timeline this way, the initial Planned Start and End dates are set automatically. The entity takes about 30% of the Timeline’s length. In order to quickly reset planned dates for an entity, either drag it back into 'Backlog' column or make a right-click with your mouse and select 'Unplan' context action. 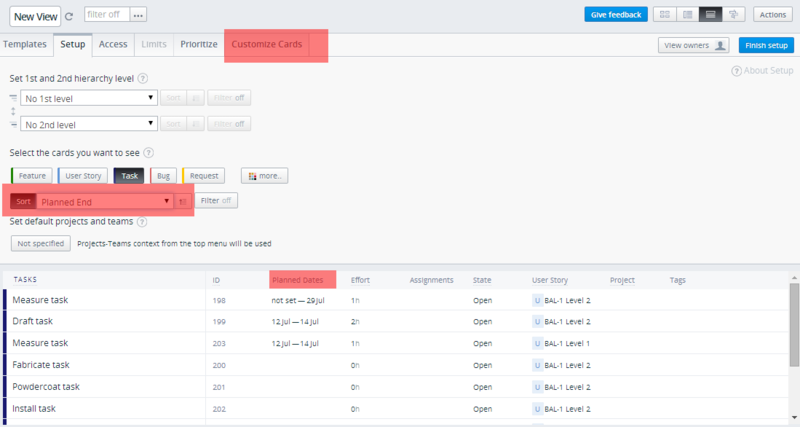 Customize Cards in order to add a Planned End Date unit or column to your views. You can also sort your entities by their Planned End Date. Install the Parent Entity Planned End Date unit Mashup to make these units available. 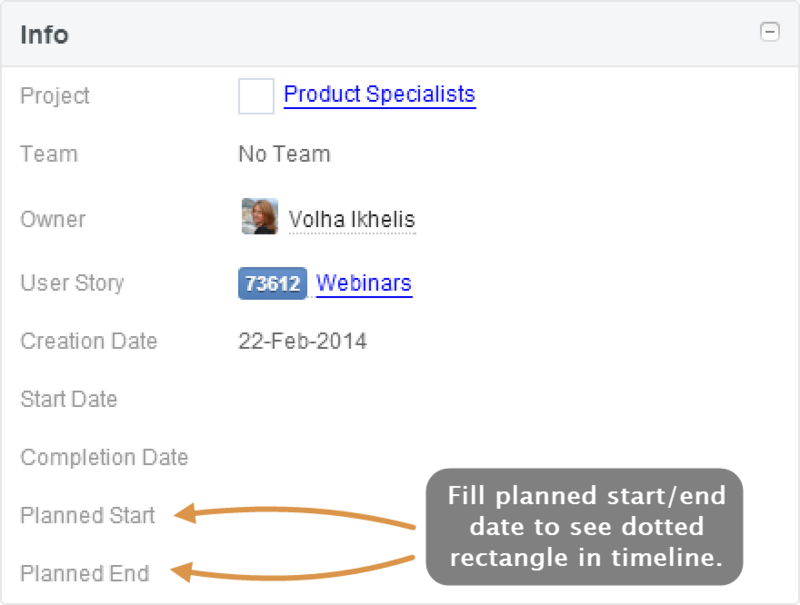 It is possible to add a visual indication that planned entities are not being completed on time. Use Visual Encoding filters to color cards based on the difference between the Planned End Date and Today as shown below. If you do not want to see Done cards at all - you can get rid of them completely using filters. The filters for due date can be effectively combined with the following filters based on current state or progress of your entities. To combine filters, use the AND, or OR operators with brackets. Find more useful examples of Advanced Filters in the dedicated article that describes Filters by dates. Custom Report with selected columns and filters. You can display and compare fields including Planned End Date vs End Date (actual), Planned Start Date vs Start Date (actual) and much more. Do you want to filter your cards by the date of their last state change? Starting from version 3.9.1 you can use the LastStateChangeDate field for filtering and visual encoding. Alerts, alarms and reminders for due dates are not exist in Targetprocess as of now. Please upvote a topic in our public backlog if you would like to see this capability added in the future. There is a custom rule for the User Story entity you can activate - "Move a User Story to “Planned” state when its Planned Start Date is set". Currently this is the only entity type with this rule available. It is possible to update planned start date and planned end date for multiple cards alltogether. 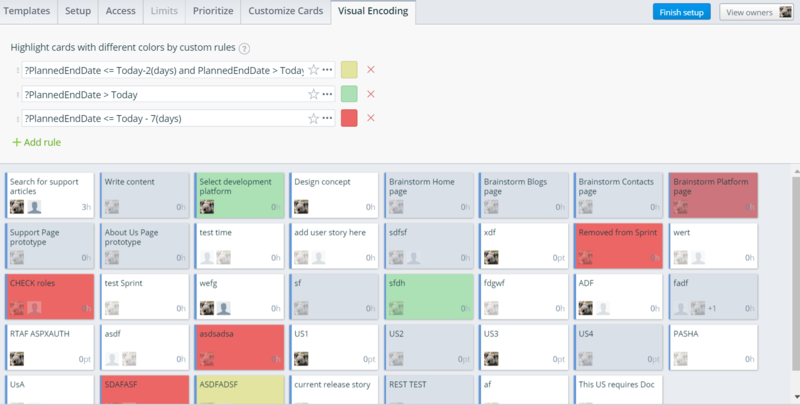 For this purpose, use board view. Select 'PlannedStartDate' or 'PlannedEndDate' as column axis. Mark columns for 'source' and 'target' dates with checkboxes in headers. Press 'Focus' button. Then select multiple cards in source column, drag'n'drop them to the target column. To select column in the future, use 'left' and 'right' buttons to switch across pages.